Home » Blog » Real Food Sloppy Joes! 1/8 teaspoon cinnamon, Optional: This was the "secret" ingredient that reminded me of the Sloppy Joes from my childhood, but I realize it's out of the ordinary so decide for yourself if you like this addition! Previous Post: « Kids Don’t Need Snacks in Recreational Sports! Myself and our four and two year old made this for dinner tonight. We substituted venison for beef and it turned out excellent. I added some fresh diced tomatoes simply because they needed eaten. It was a win… the husband and one year old loved it as well. I made your Asian Coleslaw as our side and it worked great. My family absolutely loves this recipe! We skip the buns altogether and serve it on beds of shredded cabbage…yum! Thank you! Could I make this in the slow cooker? If so, any recommendations on time or method? Thanks! Hi there. I am sure you can. 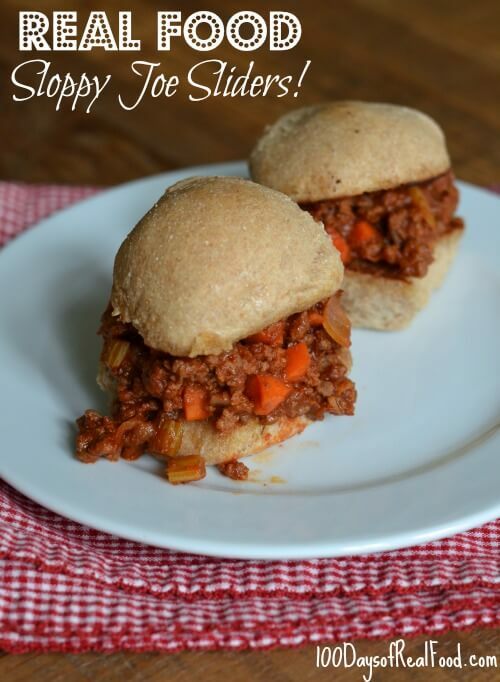 You can use Lisa’s recipe and then use this one for guidance on time and such: http://www.tasteofhome.com/recipes/slow-cooked-sloppy-joes. I make this in the crock pot…I brown the ground beef, and throw all the ingredients into the crock pot, stir it up, and let it do it’s thing! Oh Lisa I am so happy to have found this recipe!! Sloppy Joe’s are one of my all time comfort foods. I’ve been thinking about Sloppy Joe’s for weeks now and have been thinking about how I can do it without breaking the rules. Luckily I have all the ingredients on hand so we will be having SloppyJoes’ this weekend. I made these last night and they were delicious! Definitely making these again. I add just a pinch of cayenne because I thought it needed just a little heat. Also, the cinnamon was a great addition. Don’t leave it out! I LOVE your blog. I was in search of a sloppy Joe recipe and was so excited to find yours. I made it tonight. Made just a few adjustments/additions. I added some bell pepper and added 1/2tsp cumin. Also I used ground Turkey. I usually make our own sloppy Joe sauce but it is still full of stuff we shouldn’t eat,so I was excited to taste this recipe full of good and real food. I did add the cinnamon and I love the flavor it adds. Thanks for my New go to Joe recipe. Do you have a recipe you recommend for whole-wheat buns? Hi Michelle. Here is Lisa’s whole wheat recipe for whole wheat bread: https://www.100daysofrealfood.com/2011/08/17/recipe-honey-whole-wheat-sandwich-bread-for-bread-machine/. Thank you, I have seen that recipe but I don’t have a bread machine. I live abroad and they aren’t available here. Is there another recipe you can recommend? I have a whole wheat bread recipe that doesn’t need a bread maker, but it is not good for buns. LOVE this recipe! My husband and I like it BETTER than the canned stuff! We have eaten it more times than I can count. Easy recipe, too. I was wondering though, I’m trying to lose weight and do you know the nutritional info? Hi Lori. We do not provide nutrition information. This post helps explain our philosophy: https://www.100daysofrealfood.com/2013/01/04/healthy-eating-defined/. We’ve made this recipe multiple times and we love it! I just made it again tonight and I was thinking that if you put the veggies in the food processor, no one would really be able to tell that there are vegetables in this! And I leave out the celery and double the carrots because my husband hates celery. I make this all the time. I usually use ground turkey (we have Better access to better turkey). I rarely have celery around but I usually add 2 or 3 carrots instead of 1 because we looove carrots. These are fantastic! I am Paleo so i just put the “Joes” on top of a cooked sweet potato – yum! I grew up eating lots of sloppy Joes because my father loved them. We always spread thin layer of yellow mustard on bottom half of bun, sloppy Joe mix, then a bit of slaw on top of sloppy Joe mixture. IF eating with fork, we omitted top half of bun. Whole family ate dinner tonight…for once ! YaAY! Made it again for lunch today since everyone was home. Toasted the buns (I’d love it if I could find a good recipe for buns) topped with Monterey jack cheese ! Yum yum ! I think it would. You would need to brown the ground beef first. When you say 1 can of plain tomato sauce. How many ounces/mls? Hi there. Yes, Lisa’s family enjoys wheat and other 100% whole grains and sees no reason to avoid them unless you have a sensitivity or intolerance for them. Can you tell me what organic brand whole wheat buns too use! Hi there. Lisa often buys buns from Great Harvest Bread Company. You can also find Ezeikial buns in the frozen breads section of most stores. That’s funny! I had purchased the Ezekiel buns yesterday!!! Thnk you!! We’ve loved this recipe for a while, but I am gluten free now. Made it last night and served it over butternut squash ‘rice’ – it was delicious! Just made it tonight…. delicious!! Made this sloppy joe recipe for the first time. It was great. I added some diced red pepper. 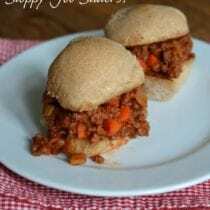 This recipe is my go to Sloppy Joe recipe. It’s very good and easy. It can be served over rice. Very good sloppy joe recipe.Made it today for super bowl.Seved them with fresh vegetables and dip. Was enjoyed by all. My family loved these! The cinnamon isn’t detectable but I think gives it a little warmth and nice flavor.